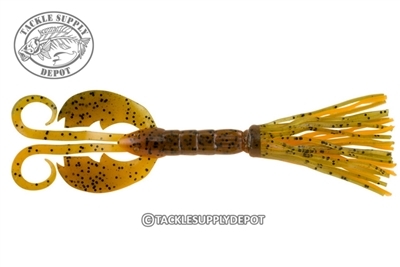 The Berkley Powerbait Bearded Crazy Legs Chigger Craw is molded with Berkley's revolutionary bearded body design that amps up the bass attracting action. Backed by Berkley's legendary Powerbait scent the Bearded Crazy Legs Chigger Craw is ideal for pairing with a football jig head to drag over deep structure or Texas rigged with a punch weight and flipping hook for probing weedlines. Pushing the envelope of both innovation and attraction the Berkley Powerbait Bearded Crazy Legs Chigger Craw delivers a dynamite crawfish presentation that bass can't resist.